Highland Park will forever be associated with Magnus Eunson, the man often credited with the foundation of the distillery at the end of the 18th century. Eunson was not a preacher as received wisdom would have it. He was a beadle (verger, a layperson who assists in the ordering of religious services) by day and a smuggler by night, the latter operation based from his bothy on the High Park above Kirkwall where Highland Park Distillery now stands. According to W. R. Mackintosh in Around the Orkney Peat-Fires (1898) Magnus ‘Mansie’ Eunson was "a flesher [butcher], beadle, and a successful smuggler. In addition to this he was a born character, brimful of pawky (cunning & sly) humour and resource, which extricated him from many a scrape.” Stories of smugglers are forever imbued with romance and poetic licence, the canny happy-go-lucky local outwitting the cowardly, corrupt and doltish representatives of the establishment; in these stories Eunson is shown as being brave and ingenious enough to enjoy many a narrow escape from the clutches of the exciseman³. Mackintosh tells us that Eunson was not a preacher, nor does his account suggest that Eunson was an illicit distiller, however smuggling was virtually a synonym for illicit distilling. He smuggled principally spirits, but remains most closely associated with the origins of Scotch whisky from Highland Park Distillery. 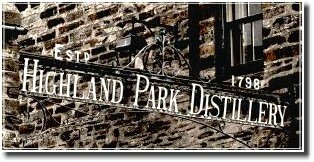 By 1798 Highland Park had been founded; later a syndicate, which, somewhat ironically, included Eunson’s arresting officer, John Robertson, and his fellow exciseman, Robert Pringle, purchased the High Park estate, including the distillery in April 1813. Excisemen had targeted the Orkney Islands and seized many illicit stills from 1805. Smuggling on Orkney had become so prevalent that one Sunday, Mansie’s minister denounced the activity as being iniquitous and un-Christian. When the sermon was over, Mansie was asked what he thought of the minister’s pronouncements; "I think that oor minister is no’ very consistent, for at the very time he was preaching, he had six kegs o’ as guid brandy under his pulpit as was ever smuggled.” Clearly, Mansie was confident that his preferred hiding place for the contraband, under the floor of the pulpit, was well-placed. Mackintosh illustrates Eunson’s cunning; he was to bring some casks of illicit whisky from Deerness into Kirkwall, so he purposely told a local worthy of his plan to cross the bridge of Wideford on the Kirkwall road between midnight and 1am with the casks loaded on three horses. The worthy was a well-known informant so Eunson was sure he would tell the excisemen of his plan. As expected, the officers were informed and proceeded to stake out the bridge at the appointed time, sheltering from the cold of the night under the parapet. They duly heard the sound of horses and sprang to confront Eunson only to find that he was heading in the wrong direction with what turned out to be empty casks. He told the officers that he had taken the full casks into Kirkwall somewhat earlier than he had mentioned to the informant, but that he had not had the heart to keep the officers waiting in the cold for him until morning. As with all folk heroes, there are stories of Eunson’s charm too; he employed his quick wits to engage a party of guagers (an excisemane) in banter and humour after they caught him with kegs of smuggled spirit in a cart and insisted he accompanied them to Kirkwall to deal with the matter. So entertaining was Mansie that the guagers failed to notice a number of his accomplices creep behind the cart and remove the kegs one by one as the party made its way towards town. By the time they reached Kirkwall there was no evidence left so no charges could be brought against the smuggler. Finally, in 1813 Magnus Eunson was arrested for transporting illegal substances; four packs of untaxed salt and one pack of whisky. To quote Mackintosh; "At length Mansie was taken before the Session for smuggling, and he lost his situation as a beadle. He took this so much to heart that he gave up attending church.” When Mansie was tackled about his absence by the minister he had as usual a ready answer. Indeed he insisted that he did still attend church. The minister said this was not true but Mansie replied; "My wife is there every Sunday”. He pointed out that when he got married the minister who conducted the service said he and his wife were now one. "Either you or the other minister has tellt us a lee (lie)” retorted Mansie. Curiously, though, the case never went to trial so Eunson was never sentenced. This has led to suggestions that he was merely the front man of a larger, better-organised smuggling operation. The disappearance of Eunson following his arrest contrasts with the meticulously recorded development of Highland Park from 1818. That was the year that straw-plaiting¹ businessman and farmer Robert Borwick together with his son-in-law, John Robertson became official co-founders of Highland Park Distillery. This was around the time that Scotch whisky was gaining a higher profile; King George IV paid his famous visit to Edinburgh in 1823, in effect granting Scotch whisky royal approval, and the following year the Excise Act halved taxes on spirits. In this short space of time whisky distilleries were taking out licences, the King developed a fondness for whisky and tax cuts made Scotch whisky a much more attractive commercial proposition. Little wonder that expansion followed. The High Park was now officially called Highland Park and in 1826 John Robertson moved south, with Robert Borwick buying out his share in Highland Park. Borwick died in 1840 and the distillery was taken over by his son, George, who invested little in the distillery and, upon his death, the value of fixtures and fittings had shrunk to a mere £104. James Borwick (George’s younger brother) inherited the distillery in 1869 but, as a church minister, he felt ownership of a distillery was inappropriate so he put it up for sale. Initially there was no interest and the property was offered at £450 on the condition that it was used as a poor-house. However, in 1876 the distillery was purchased by the newly formed partnership of Stuart & Mackay. These were great days in the Scotch whisky industry and business boomed. Highland Park whisky enjoyed first class status and became (and remains) extremely desirable to blenders for use as top dressing, to give blends backbone, structure and flavour; Chivas Brothers, Haig & Co, George Ballantine & Co and John Dewar & Sons all became customers. Many of the distillery ledgers can be seen at the new Kirkwall library archive. The day book records on March 13th 1876 that Chivas Brothers, Merchants, Aberdeen bought 117 gallons of whisky at 3/10 per gallon, making a total of £22, 14 shillings and 4 pence. On February 7th of that year John Graham, a Glasgow merchant, bought 734 gallons. In the late 19th century the distillery was still happy to deal with direct sales; in August when Dr Bruce of Kirkwall bought two gallons and the Reverend John Dangerfield of Sanday bought 5 gallons. It reached its peak during the Napoleonic Wars as trading restrictions meant a shortage of Italian straw. The industry collapsed in the 1860s with the advent of cheap, Chinese imports. On the maiden voyage of his liner, the Pembroke Castle, Sir Donald Currie visited Kirkwall in 1883. The whisky of Highland Park made such an impression on him that he took a quantity with him for the remainder of the voyage, during which the King of Denmark and the Emperor of Russia expressed their appreciation of Orkney’s finest. In 1895, on the death of William Stuart, James Grant became the partner of James Mackay. The library archive chronicles the alterations and improvements made to the distillery by Charles C Doig, renowned engineer and architect. 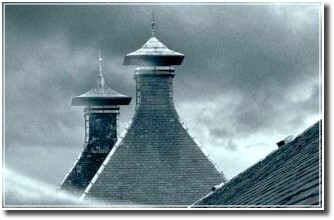 The Grant family retained control of Highland Park until 1937 when the distillery became part of Highland Distillers’ portfolio; the other distilleries in the group were Glenrothes, Tamdhu, Bunnahabhain and Glenglassaugh. Highland Park was run as a wholly-owned subsidiary and retained the name James Grant & Co for many years. The abiding care and attention, the hallmark of Highland Park production, manifests itself in the distinctive aromatic, full-bodied floral sweetness of the whisky. Highland Park’s incomparable balance comes from a tension between the aromatic Orkney peat and the sweetness of oak casks seasoned with Oloroso sherry. The accolade of Best Spirit in the World wasn’t a one-off. Highland Park has been picking up medals and awards for over a decade. Magnus Eunson chose the High Park site because of the outstanding water source. There may be little evidence of him being an illicit distiller but, over 200 years of distilling history on the same site – resulting in Highland Park becoming the most respected single malt in the world – is evidence enough that he knew whisky. smooth, balanced single malt, with a rich full flavour and a gentle smokey finish. Nose: Heather-honey sweetness; peaty smokiness. Palate: Rounded smokey sweetness; full malt delivery. Finish: Teasing, heathery, subtle smoke. Delicious. Take your time to appreciate the nose of Highland Park 12 Year Old and you’ll discover the characteristic honey sweetness followed by fruit – maybe pineapple, apple or pear. On the palate it is drying and leaves a gentle smokey feeling and a flavour that just keeps on going. Highland Park 15 Year Old is an exceptionally fine whisky that builds on the world-class reputation already enjoyed by the 12 Year Old, added to which the rich, mature oak makes a truly smooth and satisfying malt. Colour: Full golden, clear and bright. Bouquet: Aromatic smokiness with a hint of camphor. Palate: Rich, initially sweet developing into a dry smokiness. Finish: Rich, long medium sweet then medium dry. 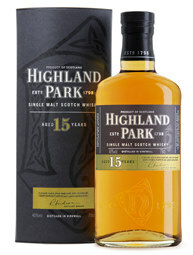 Highland Park 15 Year Old has a remarkably complex nose with notes of camphor, peat and citrus fruits and flowers. The drying sensation on the finish leaves a rich smoky feeling and the immediate desire to refill your glass. Highland Park 18 Year Old is an exceptionally fine whisky that builds on the world-class reputation already enjoyed by the 12 Year Old, added to which the rich, mature oak makes a truly smooth and satisfying malt. Colour: Natural colour; burnished gold, clear and bright. Bouquet: Rich, mature oak; top note of aromatic smoke. Palate: Rich, full flavour; honey and peat. Finish: Soft, round and long. 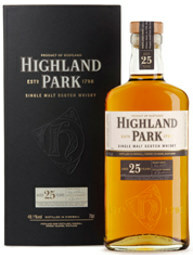 Highland Park 25 Year Old is an outstanding cask strength malt whisky imbued with richly satisfying qualities. Allowed to mature until it has reached an unqualified perfection. 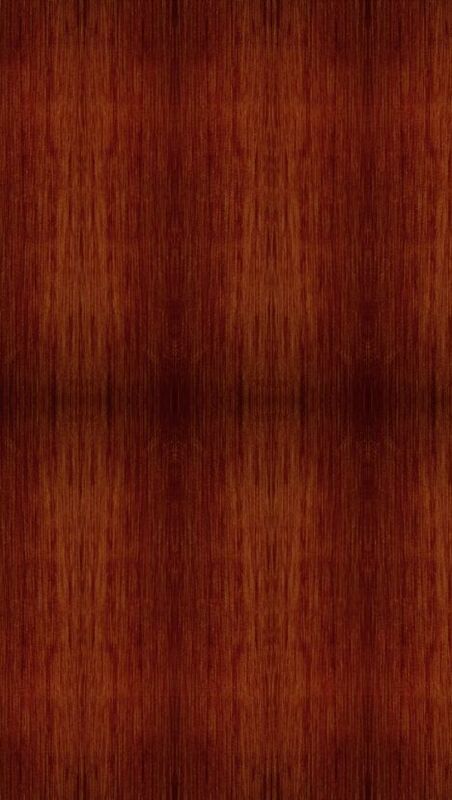 Colour: Natural colour; dark red golden, clear and bright. Palate: Full, rich burst of flavour; soft honey; nutty toffee. Finish: Rich, long and surprisingly sweet for its age. Add a drop of water to Highland Park 25 Year Old and enjoy an immense vanilla sensation with the characteristic honey sweetness developing into complex aromas of white chocolate, cinnamon, nuts and dark fruit. The finish is at once intensely sweet and gently smoky and goes on and on. 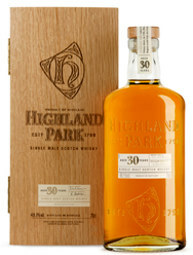 Highland Park 30 Year Old is an exceptionally fine whisky that builds on the world-class reputation already enjoyed by the 12 Year Old. It is the oldest single malt within the Highland Park range and is one of only a few 30yo distillery bottlings to be released on a permanent basis. Bouquet: Very rich, mature oak; chocolate; fudge. 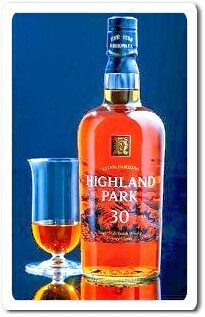 Highland Park 30 Year Old merits time and attention. It has spent 30 years maturing so treat it with respect; you’ll discover the characteristic fudge sweetness together with complex aromatic spices and dark chocolate orange. It has a drying finish, leaving a gentle smoky flavour and a mildly salty aftertaste – the result of 30 years ageing in the Orkney sea spray. USA Buyers: Click Here for Full Selection of Highland Park! 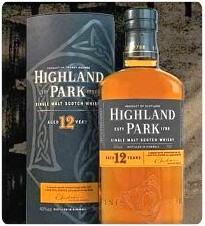 Europe/Asia Buyers: Click Here for Full Selection of Highland Park! A stay on the awe-inspiring islands of Orkney would not be complete without a visit to the northernmost Scotch Whisky distillery in the world: Highland Park. A tour of this renowned distillery is a wonderful way in which to learn more about the history and traditions of these unique islands. In 2002, the Scottish Tourist Board awarded the distillery their Five Star Award in recognition of its excellent facilities and services. We are delighted to advise that we have retained our Five Star rating ever since. The distillery is closed for the festive holidays. Tours out with these hours are by arrangement only. The admission charge is £6.00 for standard tour. We have disabled facilities with access to the site. In addition, we offer for the enthusiast a Connoisseur tour which includes an in-depth tour of the distillery and a taste of 12, 15, 18 and 25 year old expressions of Highland Park. The cost of this tour is £35.00. We also conduct a very special Magnus Eunson Tour; this consists of the in-depth tour with a senior guide, a full range tasting culminating in the 40 year old and includes a special oak-framed certificate commemorating your visit, a unique 40 year old glass and a Highland Park Book. The cost of this tour is £75.00. It is only available for groups of eight or less. Transport to and from accommodation is offered. NB. The distillery Silent Season takes place from 26th June until 18th August during which time tours may be disrupted due to essential maintenance work being carried out. Please call the visitor centre on 01856 874619 for up to date information. From the Stromness on the A964 turn right on the outskirts of Kirkwall at the Esso into Pickquoy Road, then at the T-junction, make a right and after a short distance join the A961 for South Ronaldsay. The distillery is on the left. Parking is on the right opposite the distillery entrance. As you enter the courtyard, bear right up the stairs into the coffee shop, where you will be given one of the warmest of Orkney welcomes. There is a video loop to watch and beautifully painted sketches that illustrate the steps in the distilling process. Highland Park stopped distilling for the duration of the Second World War from 1939. Its war effort was confined to the mash tun being used as an enormous bath for some of the 60,000 troops stationed on Orkney. That was the year in which HMS Royal Oak was sunk by a German submarine in Scapa Flow and Sir Winston Churchill visited the distillery. When offered a cup of tea upon his arrival, he is recalled as stating his preference for a glass of Highland Park in a typically direct manner. The distillery returned to production in 1945. Highland Park was available as an independently bottled 8 year old at the time. It was felt, however, that the time was right for a proprietary bottling; Highland Park 12 year old single malt was launched in 1979. In its first year, fewer than 100 cases were sold. In the 1990s the profile of Highland Park rose sharply. The Highland Park 1967 was released in 1991 and the then Chancellor of the Exchequer, Kenneth Clarke, toasted the health of the Scotch whisky industry on Budget day with a dram of Highland Park 12 year old in 1993. Then in 1997 and 1998 came a succession of eagerly-awaited new releases; Highland Park 18 year old and Highland Park 25 year old made an immediate impression on whisky writers and enthusiasts the world over. At the same time Highland Park 35 year old, Goodwin’s Reserve, was released as an eponymous limited edition for the then retiring Chairman of Highland Distillers. The following year was the Highland Park Bicentenary; celebrations were held at the distillery and a highly-regarded commemorative Bicentenary Edition bottling (21 year old, distilled in 1977) was released. Also in 1998, Highland Park underlined its commitment to embracing new technology when relevant by holding an on-line single cask tasting. A panel of journalists sampled a number of different casks and agreed on their favourite, a 1974 vintage, which was subsequently bottled. More new releases were to follow; Highland Park 1958 released (as a 40 year old) in 1999, a limited edition of 2,000 bottles of Highland Park 2000 were released to mark the millennium. Next came a limited edition of 5,400 bottles called Capella, a whisky commemorating the 60th anniversary of Orkney’s world famous Italian Chapel. Built by prisoners of war using mainly scrap materials, the Chapel is an abiding memorial to their time spent on the island and a manifestation of the strength of the human spirit. It is as dramatically ornate on the inside as it is austere on the outside. The bottle features an illustration of the Chapel painted by the man responsible for its creation, Domenico Chiochetti. Since then, there have been a further three expressions launched; Highland Park 15 year old was introduced in the UK in 2003, Highland Park 30 year old was introduced in April 2005 and picked up the award for Best Imported Whisky in Malt Advocate magazine later that same year. In September of 2005, Highland Park 16 year old was launched as an exclusive for global travel retail and duty free markets. I know this site presents quality depending articles or reviews and extra material, is there any other site which presents such data in quality? That is a great tip particularly to those fresh to the blogosphere. Brief but very precise infoâ€¦ Thank you for sharing this one. A must read article! Admiring the time and effort you put into your site and detailed information you provide. It&#039;s great to come across a blog every once in a while that isn&#039;t the same old rehashed information. Excellent read! I&#039;ve saved your site and I&#039;m including your RSS feeds to my Google account. Magnificent web site. Lots of useful info here. I&#039;m sending it to some buddies ans also sharing in delicious. And naturally, thanks on your effort! There&#039;s definately a lot to know about this topic. I really like all the points you made. Hi, i read your blog occasionally and i own a similar one and i was just wondering if you get a lot of spam responses? If so how do you prevent it, any plugin or anything you can advise? I get so much lately it&#039;s driving me mad so any help is very much appreciated. Ahaa, its fastidious discussion about this post at this place at this weblog, I have read all that, so at this time me also commenting here. The new Mr & Mrs Sutherland - Thank you for putting us all at ease and very very pitneat can&#039;t wait to see the rest of your work on our return from the honeymoon.